Copper Pipe, 2-In. x 10-Ft.
Refrigerator Tubing, 3/16-Inch OD x 50-Ft.
Hard Copper Tube, Type L, 1-In. x 10-Ft.
Hard Copper Tube, Type M, 1-In. x 10-Ft. 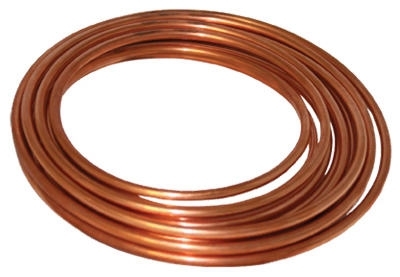 Residential Copper Tube, Type M, 0.75-In. x 5-Ft.
Hard Copper Tube, Type M, 0.5-In. x 5-Ft.
Commercial Hard Copper Tube, Type L, 0.5-In. x 5-Ft.
Commercial Hard Copper Tube, Type L, 0.75-In. x 5-Ft.
Commercial Hard Copper Tube, Type L, 0.5-In. x 2-Ft.
Commercial Hard Copper Tube, Type L, 0.75-In. x 2-Ft.